Approach getting into nature as a lifelong pursuit. One of the worst things you can do to yourself is to set initial goals too high then fizzle out. OK, set one or two of those ‘shoot for the moon,’ just out of reach stretch goals but here is something to keeping things simple, well-rounded, gradual and attainable. When starting, it is most helpful to find out what kind of hiker you are, how to gradually build to bigger hiking goals and not to disappoint yourself. Then move on to the bigger and better experiences that life throws your way. You need to get to know yourself as a hiker. Consider the kind of hiker you are. Are you new to hiking? What kind of health are you in? What kind of time do you have to hike. What are your goals for getting into nature. Are you determined, disciplined and goal oriented or not. The way to find out about all this and more is to start with a few pieces of essential equipment and simple walks. TIP: Preparing for a hike is preparing for life. If you prepare for one hike it is more a terminal project. When it ends there is a bit of a letdown. Approach getting into nature as a never-ending process of being conditioned, becoming an interesting person and learning what happiness is. Nature is endless; one trip leads to two, then to four and . . . How about llama back packing in Wyoming? TIP: Make things simple – think from the ground up. Just about any endeavor starts with the basics, with a foundation. So, think from the ground-up, start with the right foot gear. Durable – Ensure they are well constructed, supportive, comfortable and perform well for you and your kind of hike. Wicking – Your feet will get wet even on a dry day. The right boot/shoe takes moisture from your feet. AND broken in – Hike close to home to acclimate to the equipment and the rhythms of the trail, harden feet and strengthen ankles. Hiking poles – The discussion rages! – two poles, one pole, no poles. We are bilateral. It is common sense that two poles to properly involve your torso which eases the strain on the lower body and increases distance if that is your goal. Get a good pair and learn to use them, that is, be able ‘to have a conversation with them.’ Use them until they become unconscious extensions of your arms. Get good ones. Hip pack – A pack is yours, so are its contents. At least consider water, a snack or power bar, a toilet kit, some band aids and such and perhaps a map. Always practice orienteering especially when you don’t need to. Always know where you are. Broad Brimmed Hat – The folly of being a sun worshiper is well, folly. Keep well covered; a broadbrimmed hat is a good item to start with. Some put a bandana on their head under the hat, so it falls over the neck. Clever! One can use regular outdoors street clothes for this first venture. Get and learn to use this basic equipment. While doing so, you are learning The Art of The Walk, getting conditioned to the trail, learning what kind of hiker you are, finding out what kind of hike you want to do and your ability to do so. Oh yes, you will be meeting neat people during this process and especially on the trail; some become fast and life-long friends. Little is invested, and it is a gradual beginning to what can be a life time of experiences. And it saves a ton of money too. There are few things as edifying as outfitting for a bucket-list trip in the back country, getting there and realizing you would rather be SCUBA diving. TIP: Don’t make things complicated. Remember the formula S3: Simple, Suitable, Sustainable. Let’s keep with the themes of beginning hiking and approaching it as a process. Simplicity – Keep things to their basic elements. Get the basic stuff mentioned and gradually take longer walks on increasingly demanding trails. 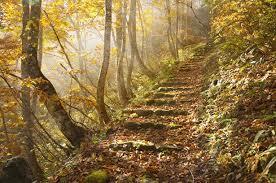 Hopefully you will be blessed with many accessible nature trails just outside your door. Suitability – What you do has to be age appropriate. It is a great thing to grow old gradually, gracefully and giving. It does not take extremes to be conditioned and healthy. The process of hiking is a good way to get in shape: A pear is a shape and that pear can be in great condition. Sustainability – Look to the future. It is best to tackle things that can be done for a lifetime. Hiking can be done by just about anyone for as long as they like. Stick with it and you will crave what is good and right. TIP: Get real – Set goals suited to you. Your overall goal should be to be vital and vigorous well into your 90s; old enough to be that crusty ol’ codger or codgerette you always knew you could be. You want to be good at life, make memories and friends, have fun and make a difference. Try this life goal: ‘To be able to lift a bag of dog food at 90+.’ In other words, be able with life’s tasks to the end. The best years of your life will be after you are 60!